Home › Pix of the Trade › Better Way To Fly! 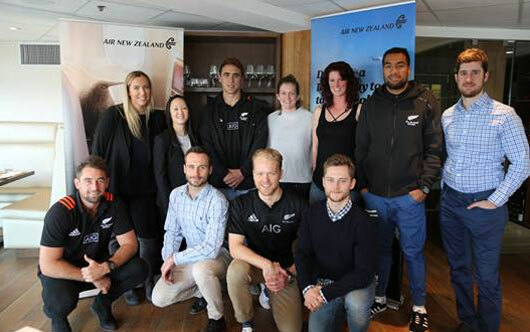 Air New Zealand and the All Black Sevens recently treated members from the Canadian travel industry to an interactive meet and greet event. To attend, travel agents were asked to submit a photo describing what a “Better Way to Fly” meant to them. The 10 lucky attendees received the most votes out of all the contest participants. Pictured, front, Kurt Baker, Campbell Alexander, Ted Cran, Thomas Cameron; Back: Erin Krupnik, Maureen Kam, Joe Webber, Liz Wilson, Victoria Mearns, Sione Molia and Stephen Brunetta.